Threes is a really fun, addictive game, but it's only on iOS. Well, someone created a browser-based "demake" of Threes that you can play right in your browser. The demake was created by developer Benjamin Davis, and it's a cool re-imagining of the art style for the game. It's also WAY HARDER to play without the numbers, or the ability to preview a move. That said, you really should buy the full, non-demaked game. It's wonderful. 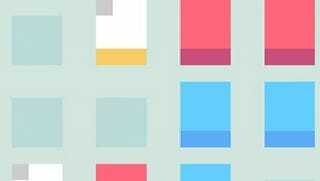 If you have an iOS device, get the official Threes here.